The pair discussed the country's education achievements and promised further cooperation along those lines, according to the state-run Xinhua news agency. Apple has been eager to push iPads and its Swift programming language into as many schools as possible. The executive also visited the Forbidden City, promoting apps that "help people around the world learn about Chinese culture," as he wrote in a Weibo post. Similar stops involved visiting Hongen Education, which is integrating augmented reality into its products, and talking to members of an education startup called iHuman. Cook first arrived in the country on March 21. That night he attended a Today at Apple music event at the company's Wangfujing store. His return home will likely happen Sunday if not Saturday, given that he's likely to appear at a press event on March 25. The company is widely expected to showcase its upcoming video service, as well as paid Apple News subscriptions. Is it safe for Tim Cook to do this? China has a tendency to arrest people of foreign origin. Considering China has tens of thousands of people who rely on Apple (through Foxconn) for their income, it would be against their interests to irritate Apple. Hopefully he doesn’t leave any prototype Apple devices laying around unattended in his hotel room. 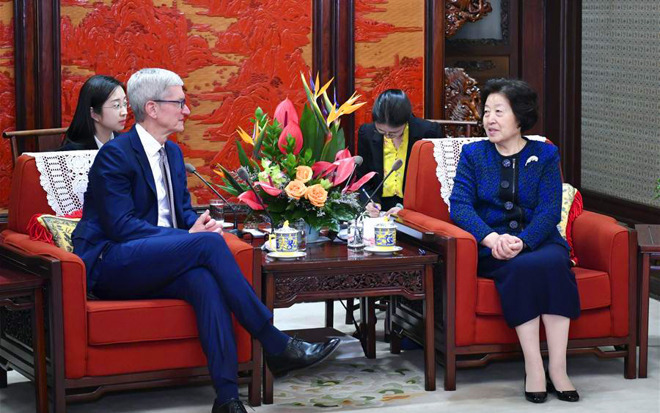 Tim Cook has to be the best industry CEO from the USA to repeatably visit and learn in China. ...teaching the Chinese Authorities firm lessons about docility, intellectual property, privacy and human rights. What official policies have they changed as s result of their interactions with Tim Cook? No, that's the U.S. and its minion Canada who arrest foreign executives they don't like. But China is big enough that they have not yet retaliated against any U.S. executives. Very mature of them. Apparently Tim does not see China as a threat but as a very capable partner. Smart. Very clearly, they are both. And I'm quite sure he does understand this. Since, the threat part only came from Trump and his minions, I am not at all sure that they are a threat -- except economically. They simply don't have our insecurity driving a desire to dominate and control. Instead, their dominance derives from doing things better. But some are threatened by that. Tim is too smart for that stupidity and knows to leverage their considerable abilities to our advantage. Lol...the most insecure feeling major government is the PRC. That’s even with the Brexit fiasco in progresss. There is a reason for tight control over media and thought in China...they fear another revolution. The income disparity is high, the population aging and these are existential threats to the government if they cannot find a soft landing. They are growing at 2-3 times the rate of the U.S. -- while loaning us money to pay our bills and for Trump's TaxScam. Who has the great firewall and censors any dissenting opinion? Who fears religious freedom and free press? Trump and China are two sides of the same coin. That Trump tries to discredit the press and demonize Muslims is based on that same inherent fear. That and he’s just a world class grifter. Dunno why any American would be a apologist for a brutal communist regime but there are dumb shits everywhere and not just in trump country. I think you overestimate justice and freedom in the U.S. and underestimate it in China. The 'Totalitarian' thing has been way oversold by the right while the 'Freedom' thing has been way oversold here.